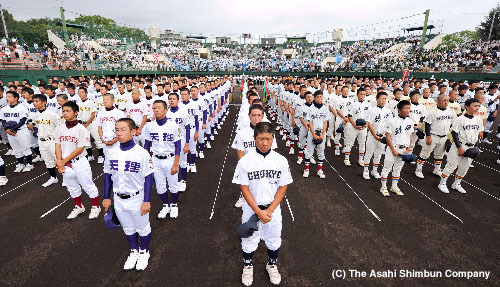 56th National High School Rubber Baseball Championship participated by 16 regional winners of preliminaries throughout Japan started on August 25 in two baseball stadiums in Hyogo Prefecture. Takayasu OKUSHIMA, President of Japan High School Baseball Federation who is also a strong advocate of rubber baseball to develop the sport worldwide, declared at the Opening Ceremony that rubber baseball was uniquely born in Japan and is now a part of national culture. The tournament will last for 5 days with Gold medal scheduled on August 29.